Nature’s Classroom hosted and instructed a two day educational ‘Watershed Awakening’ for 23 Eagleville Elementary 5th & 6th graders, 8 Nature’s Classroom Montessori 4th-6th graders, and 26 Eagle Elementary 1st graders on March 11 and 12, 2013, facilitated by Emily Stahl, Timber-Lee Camp; Natalie Dorrler, Briana Kyle, Shari Rosenberg & Andrew Zielinski, Nature’s Classroom Institute; Mike Rutenbar, Camp Edwards YMCA; and Eric Howden, Brian Gifford and Pamela Meyer along with teachers from the participating schools. 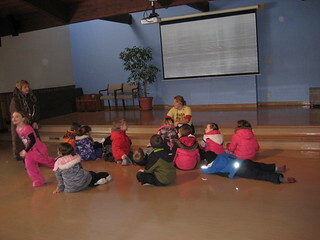 This is one of several watershed educational activities facilitated by the Friends’ Watershed Educator’s Consortium partnering under a 2012-2013 a Wisconsin Environmental Education Board (WEEB) grant. Look for more opportunities to volunteer and help these groups outreach to users of the Mukwonago River. The 1st graders on Tuesday spent the morning doing water activities inside and at the floating classroom on Rice Lake, learning about the water cycle and the animals, plants, birds, insects, fish and others living in a lake, including the requirements for life in a watershed, the sun and wind and water cycle as all these things are connected for a healthy watershed and its inhabitants. The Friends’ Education committee has been very active in this process and continues to work with our local youth camps and schools to bring awareness of the Mukwonago River to those who live in the watershed and those who use the watershed about its pristine character and value to all of us. Emily trained several trainers and facilitated knowledge around groundwater models that already are available in the local camps, sharing resources and parts with the other camps to allow better use of these models by a wider range of personnel. Each of the camps should now be better able to enhance the value of these tools, and use them more efficiently in their programs. Emily noted that she gleaned new ideas from NCI instructor Shari’s water filtration activity that she will share with her own camp interns and incorporate into Timber-lee’s activities. The shared ideas and resources is a large part of the expectation we hope for these grants. Our many watershed camps, as well as local schools, are an enormous resource for watershed education. Thank you to each and every one of them.